This week, a bunch of rumors have been circulating that Apple is preparing to offer an Unlimited subscription to iTunes on a yearly basis with hardware purchase. Will we be clicking Subscribe anytime soon? This past Tuesday, a report from Financial Times cited internal sources from within Apple claiming that the company is considering the option of subscription with a purchase of new hardware for the future. Similar to Nokia’s recent “Comes with Music”, a bundling of a one year subscription to their music store rolled into either hardware or service charges, thus appearing to the consumer as free. Theoretically, new iPod Touch or iPhone users could opt for this service for a premium charge- more likely free to iPhone purchasers and a fee for those who buy the iPod Touch. The idea would not only entice customers to use Apple’s iTunes but keep them with the Fair-Play DRM. While Jobs sometimes goes back on statements similar to these, besides the movie rentals, he has remained fairly consistent with the pay-as-you-go model in the 5 years since the introduction of the iTunes Store. With over 4 billion songs sold to date, the iTunes Store accounts for more than 70% of all digital music sales worldwide. 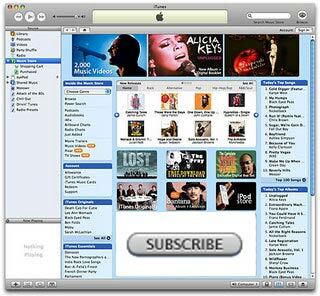 Even beyond the large success of the iTunes Store, while the Unlimited iTunes Music model might not be a bad idea both for Apple and iTunes, it will not happen- at least not in the near future. Until we see a successful subscription model come out, or even the success of the Nokia “Comes with Music” promotion, we can rest assured that Jobs and Co will remain selling tracks to own for years to come. Scratch this one off your rumor list.